Scale with weight capacity: 120g - SHIPS FREE! Scale with weight capacity: 160g - SHIPS FREE! Scale with weight capacity: 210g - SHIPS FREE! Scale with weight capacity: 250g - SHIPS FREE! Scale with weight capacity: 80g - SHIPS FREE! The Nimbus Analytical Balances are high-performing scales that have an innovative design to allow for a compact footprint while taking up minimal space. The color-coded keys allow for easy recognition of frequently used buttons and a level indicator is included with adjustable feet to ensure balance. The balances have a 304 stainless steel pan and the metal housing protects the internal components of the scale. The keypad is sealed to protect the buttons from dirt or spills and grab handles are included for convenient lifting and transport. The Nimbus Analytical Balances come with a removable draft shield that allows for more accurate measurements by eliminating air currents. They are USB enabled and have a RS-232 system that makes it easy for balance to communicate with a computer or printer. Printouts include the date and time for the data and adhere to Good Laboratory Practices (GLP). Included with the balance is a bright, vivid LCD that is visible in any type of lighting. Another feature added to these balances is zero-tracking that allows the user to set the balance to zero after placing a container on the scale. 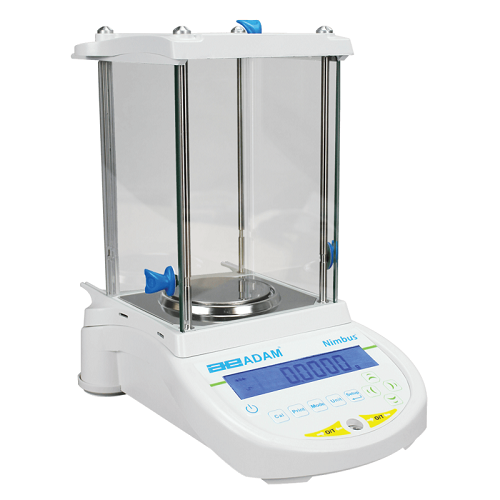 The Nimbus Analytical Balances will be a durable addition to any lab.